There really is no better way to end a day on the hill than with a glass of wine. Make that a spectacular skiing day and a glass of sommelier selected wine and you have a perfect pairing. If you want to ride a world-class ski area that has equally world-class wine cellars, here are 6 favorite destinations for snow mad oenophiles – where to ski, stay and sup! This jaw dropping valley has 250 mountains over 3000 meters high, including the tallest mountain in the Tyrol. It’s home to two of Austria’s most snow sure ski areas, Solden and Obergurgl, where you can ski 254 kilometers of pistes with a single pass. Four and 5-star hotels with delectable drinks menus are plentiful, though one trumps all others for true wine lovers. In Solden, Das Central Hotel’s sommelier, Martin, has selected 450 wines for the hotel’s wine cellar, which stores over 30,000 bottles. The colossal collection includes a Chambertin from 1918, and supersized bottles from the Kollwentz Privat, which only this hotel holds every vintage of. Wine growers from all over the world come to provide the ‘Winemaker’s Table’ dinner and tastings in the winter and the food and wine festival, Wein am Berg, takes place here every April. Holder of the Vineus Wine Culture Award, the hotel even makes its own Pinot Noir, Pino 3000 which is uniquely matured in oak barrels 3048 meters above sea level. A two-country ski area, Portes du Soleil includes the resorts of Les Gets, Morzine and Avoriaz in France and Champery in Switzerland. They share 600 kilometers of pistes (including the notorious Le Pas de Chavanette, which is considered one of the best ski runs in the world) as well as 30 snowparks, boardercrosses and skicrosses. The area’s known as the ‘gateway to Valais’, Switzerland’s biggest winemaking region and home to over 20,000 grape growers. Les Gets’ Chalet Grand Corniche may not have room for tens of thousands of bottles like other wine cellars you’ll see on this list – but the uber cool features of its wine cellar more than make up for it. In a strike of chalet architecture genius, this one can be reached by none other than a slide, from the top floor bar. On top of that, whether you prefer to sip your pinot over a spot of snooker or sumptuous feast, the wine cellar table can seamlessly transform from a snooker table to a dining table… Then there’s the fact that a stay here includes limitless (sommelier-picked, no plonk in sight) house wine and champagne. 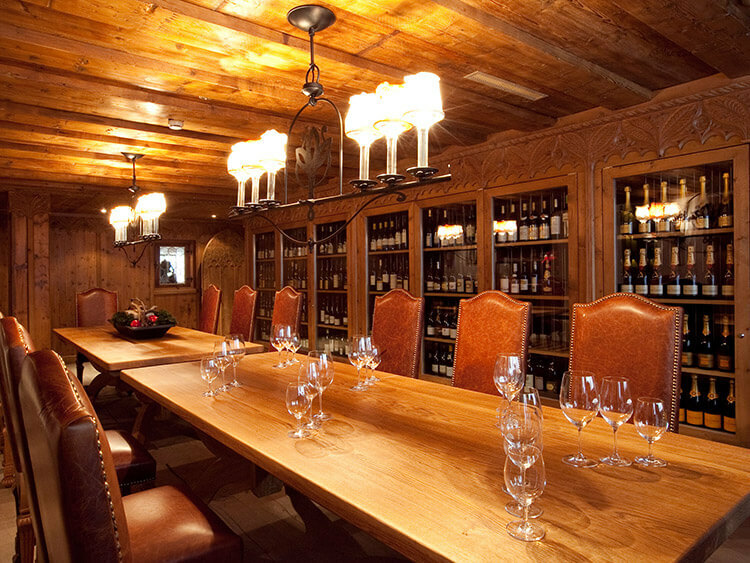 Part of SNO’s luxury chalet collection, this is the height of epicurean chalet hospitality: if your favorite vintage – however rare – isn’t in the cellar, the staff will move mountains to bring it to you. Alta Badia has 130 kilometers of its own pistes, lift links to a sizeable 500 kilometers and connections to an immense 1200 kilometers of runs in the Dolomiti Superski. If that doesn’t make you thirsty, the views of the UNESCO protected Dolomite mountains are sure to do the trick. Rich soil and a mild summer climate make South Tyrol a superb region for winegrowing, and the ‘Sommelier on the Slopes’ and ‘Wine Ski Safari’ events introduce you to the best varieties on a tour of local ski huts. In Corvara, Hotel La Perla stocks some 28,000 bottles in a fascinating labyrinth style set-up. I’ve never known hoteliers more palpably passionate about their wine cellar – they christened it Mahatma (meaning ‘soul’) and dedicate it to ‘those who know how to appreciate the joy of life’. Come open minded and ready to worship the wonder of wine and you’ll fit right in. La Perla is part of the Leading Hotels of the World Collection and besides the top-notch service, its gourmet cuisine – served in four different restaurants – really completes the experience. The fabulous Silvretta Arena ski area crosses the border to Switzerland with a 238 kilometer network of snow sure cruisey slopes, long trails, mogul runs, terrifying steeps and everything else a seasoned skier could want for. Bring your rucksack because it’s not any old Swiss ski resort you’re sharing the slopes with… It’s duty-free Samnaun, a savvy wine buyers heaven. Partnered with Laurent Perrier Champagne, Ischgl’s the founder and host of the ‘Gastronomical Ski World Cup’, which brings together the worlds of food, wine and skiing with celebrated chefs and sommeliers competing on a giant slalom. The Trofana Royal Hotel’s known for its Michelin, Falstaff and Gault Millau-acclaimed cuisine and to provide the ultimate pairing, the von der Thannen family wine cellar has over 25,000 bottles of international wines. A team of sommeliers are on hand to show you around the traditional, vaulted cellar and pluck out the perfect bottle to accompany your food picks. Known as the cradle of alpine skiing, the Arlberg is Austria’s oldest and biggest ski area. Most years it’s also the snowiest, clocking up a mighty average of 9 meters of snowfall. There are seven different bases to explore it from, including quaint St. Christoph, luxurious Lech-Zurs and après ski legend St. Anton. Between them, skiers and snowboarders have 305 kilometers of pistes, 200 kilometers of powder runs, two snowparks and two funslopes. 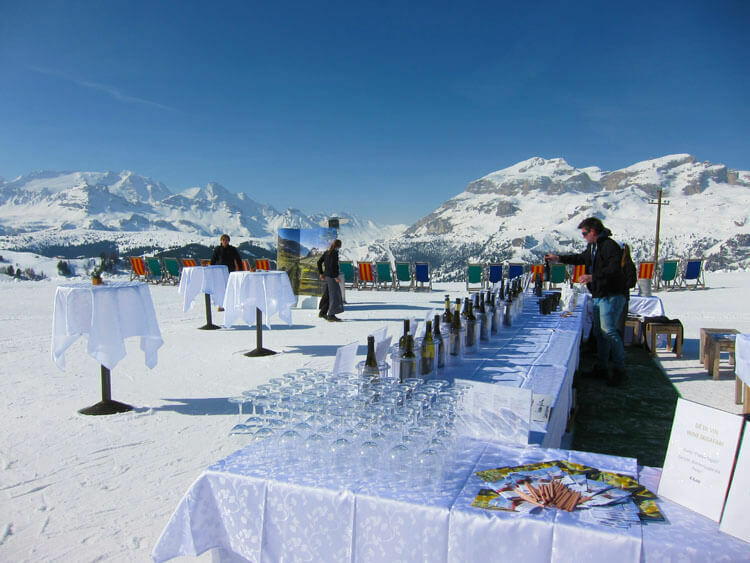 Lech’s fantastically named ‘Spring Skiing & Levitating Winegrowers’ event provides wine tasting in a gondola, where you can sip Austrian creations, mid-air, completely surrounded by mountain views. The Arlberg Hospiz Hotel (also known as the Arlberg 1800 Resort) in St. Christoph has not one but three different wine cellars: first there’s the Vinothek, where guests can attend dinners and tastings of bottles of all origins. Next there’s the legendary Large Bottle cellar, where you’ll find the biggest collection of supersized wines in the world – often chateaux have made them exclusively for the Arlberg Hospiz. A ‘travel and flavor guide’ will introduce you to the vintages, which because of their size last longer and have a unique flavor. Finally, there’s the Brotherhood Wine Cellar, which was built back in 1386 by the founder of the Brotherhood of St. Christoph and stocks a superb selection of Bordeaux and Burgundy wines. Canada’s second biggest ski area, Sun Peaks has runs of all levels, 2 alpine bowls, 7 gladed areas and a 10-acre terrain park. As well as getting a good 6 meters of snowfall for the slopes each year, the climate allows for some excellent grape growing in the Okanagan Valley. The ski out, alpine style village at Sun Peaks has been hosting events of the Winter Okanagan Wine Festival every year for over 20 years now. Taking place each January, it includes tastings of local wines paired with the likes of chocolate, cheese and coffee. The Sun Peaks Lodge usually joins in with the wine-themed festivities, hosting a Wine and Dine menu at its popular steakhouse.